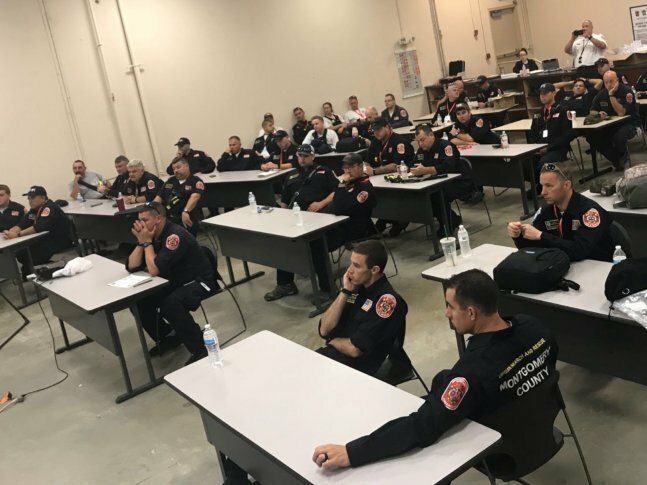 WASHINGTON — The 80-person strong Maryland Task Force One is headed to South Carolina, ahead of the potentially catastrophic Hurricane Florence. They packed their bags shortly before 6 a.m. Wednesday in a Maryland warehouse. Then headed out on buses around 8 a.m. after a final briefing. Task Force One brings a lot of equipment — and expertise. “K-9 search, water rescue, structural collapse engineers, emergency physicians to take care of victims or citizens and residents that we encounter that are in need of assistance,” Montgomery County Fire and Rescue Chief Scott Goldstein told WTOP’s Neal Augenstein as he listed the specialties of the pros Maryland was sending south. The team had been on standby until it became clear that the brunt of Florence wasn’t going to smash the D.C. area. “The state and (Gov. Hogan) cleared the Maryland team to depart … no longer needed for concern in Maryland,” Goldstein said. Columbia, South Carolina, is their first stop, but they’ll go wherever FEMA needs them. It could be 10 to 14 days before they come home. While Florence hasn’t made landfall yet, FEMA wants Task Force One to be in position. “FEMA resources are going to the Virginia-Carolina area to be in place before the storm hits,” Goldstein said. Goldstein says the team should arrive in South Carolina by dinnertime. Task Force One, with all of its equipment and vehicles, will be 100 percent self-sufficient, which they’ll need, since the emergencies surrounding Florence’s arrival could shatter any plans. “They have the ability to totally shelter themselves. They may be staying inside of a large warehouse like this at a government facility … they may be put up at a dormitory at a college or a training institution that has additional bed space,” Goldstein said. Florence is still projected to lash the East Coast as a Category 4 hurricane. It is packing maximum sustained winds of around 130 mph over the open Atlantic. And though the hurricane’s path is heading toward the Carolinas, the storm’s effects may change as the storm continues to evolve so it’s best to closely monitor the forecast. Parts of North Carolina may see 20 to 30 inches of rainfall which would produce a catastrophic flash flooding and significant river flooding, according to the National Hurricane Center. Florence has prompted states of emergency up and down the mid-Atlantic region. The National Hurricane Center warned that Florence was forecast to linger over the Carolinas once it reaches shore. See photos. So far, the D.C. area is projected to get far less rain than previously predicted — at least for now. Local impacts have been pushed back a few days because of Florence’s inland track, said Storm Team 4 meteorologist Sheena Parveen. 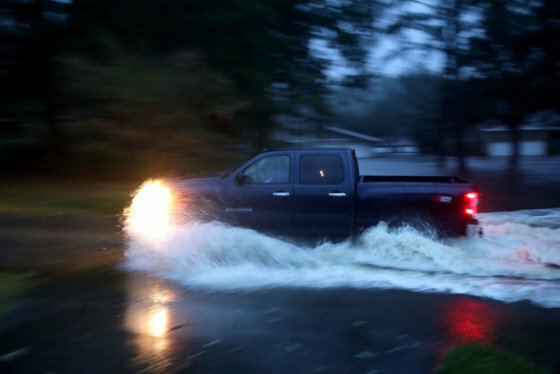 Forecasters are predicting that anywhere between 3 to 6 inches of rain will fall upon the Appalachians and the mid-Atlantic area though some isolated areas may see up to a foot of rain. Residents are urged to stock supply kits, charge phones and have plans ready to go if ordered to evacuate from the coast. Here’s an idea of what to include in your emergency kit. See an hour-by-hour checklist on how to prepare for Florence’s approach.